Trump’s anti-Iran move on Tuesday was deeply worrying for allies of the US. It is a blow for those countries, especially in Europe, that were hoping to build on the big expansion of trade with and investment in Iran after the July 2015 nuclear deal was signed. But it is more than just an economic opportunity under threat. As Germany’s Zeit Online commented ‘with nationalism and protectionism, Donald Trump is gradually eliminating the world order shaped by the USA’. Here I look at some implications of the latest U.S. policy and the reasons for its timing. The extent of the new U.S. sanctions is at present unclear, although there will be some delay before full implementation. What worries the Europeans is that they are unlikely to apply only to U.S. companies, like Boeing. On past form, any company not doing as the U.S. wishes could be liable to suffer financial penalties. They could also face problems of access to the U.S. market and its banking system – the latter being necessary for all international companies that use the U.S. dollar. This extra-territoriality of U.S. sanctions, in the words of France’s Finance Minister, Bruno Le Maire, makes the U.S. ‘the economic policeman of the planet’, and that is ‘not acceptable’. Last October, the now ex-Secretary of State Rex Tillerson claimed that the U.S. will not interfere in Europe’s business dealings with Iran. But the newly appointed U.S. ambassador to Germany, Richard Grenell, has taken a very different tack. He followed up Trump’s statement with a threatening tweet: ‘German companies doing business in Iran should wind down operations immediately’. It would be hard to top that as a sign of imperial arrogance, something that has become ever more embarrassing for U.S. allies under the Trump regime. To have a smoothy like Obama advance U.S. interests after a chat among ‘friends’ was acceptable. Now the veneer is off and the modus operandi of the nincompoop POTUS is to fart, blame someone else and carry on regardless. 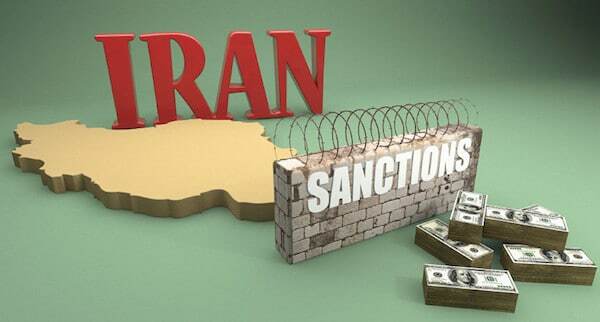 Following the long years of sanctions, Iran is far from being a big economic partner for the major western powers. Last year it was only number 33 in the ranking of external trading partners of the European Union. Trade between the EU and Iran was close to €21bn, with a little over €10bn of both exports and imports, but this made up less than 1% of the EU’s total external trade. EU trade with India is four times bigger, and it is more than seven times bigger with Turkey. U.S. trade with Iran is much smaller still, roughly $200m last year, which is barely a rounding error in the statistics. Nevertheless, there had been rapid growth in trade for the EU in recent years, mostly imports of fuel from Iran and exports to Iran of manufactured goods, especially machinery and transport equipment. From 2014 to 2017, EU exports grew by nearly 70% and EU imports by nearly nine times. Much more trade growth has been in prospect, together with attractive investment opportunities, for EU companies such as Renault, PSA Group, Airbus, Siemens, Total, Alstom and others. Iran’s half-wrecked economy offered a cornucopia of deals in the tens of billions to refurbish, resupply and rebuild. All that is at risk with the new U.S. policy. More important, however, is that the Iran deal was the result of a longwinded negotiation involving all the major powers, and now the U.S. has walked away from it. This calls into doubt the status of more or less anything else the U.S. has signed up for in the past, and also the status of the U.S. as the unquestioned leader of the western powers. Why did former president Obama’s signing of the joint agreement with Iran look like the ‘worst deal ever’ for Trump? First, note that the U.S. has sustained hostility to a country that dared to step out of line in 1979, when the Shah was overthrown, and has since not been cooperative enough. While the U.S. has come around to accepting other miscreants – notably Vietnam, which beat it in a war – this is very rare and is, in any case, a very slow process. Similarly for Cuba. The irony in Iran’s case is that, aside from sections of the elite who make gains from managing the sanctions regime to their advantage, the country was overwhelmingly in favour of doing a deal with the west as a means of gaining access to technology and development. Nevertheless, despite signing the 2015 deal, Obama was not exactly friendly to Iran. Even afterwards, U.S. political prejudice hindered American business prospects in Iran, with the Europeans much quicker to take advantage. What seems to have scuppered the Iran deal now is the problem that U.S. policy faces in the Middle East region. This is behind Trump’s long signalled change of course. Apart from its own direct military intervention, the U.S. has had two elements of control in the Middle East: Israel and Saudi Arabia. Each of these has become more unstable and problematic in recent years, causing trouble for western policy and some embarrassment when it comes to ‘human rights’ in family plutocracy Saudi Arabia and Palestinian rights in the racist gangster state of Israel. Yet the U.S. has not been able to find alternative local tools. After the disaster of U.S. policy in Iraq, another adventure, to replace Assad in Syria, and so to undermine Russia, has failed. This now leaves the U.S. with two dysfunctional supports in a region scarred by imperialism, a mess that it cannot sort out. The U.S. inability to get rid of Assad has raised Saudi Arabian and Israeli paranoia about Iran. Worried about the stability of their own regimes, they see a long shadow from the bogeyman who does not necessarily do what the U.S. wants and use this to disturb the US’s own discontent. This is neatly summed up in the invention of the so-called ‘Shia crescent’ of Iranian power and influence from Iran through Iraq, Syria and into Lebanon and the Gaza Strip. Saudi Arabia even sees Iran in Yemen, while Netanyahu starred in his own special anti-Iran video for Trump. In an inversion of reality that only someone of his powers can provide, Trump even outdid them with his latest comment that Iran backs al-Qaeda and ISIS. Trump will tweet and things may change again. But it looks like the foundations of the world order are crumbling further. Apologies for lowering the tone, but the word ‘trump’ in colloquial English also means to break wind. Tony Norfield worked for 8 years as an economic consultant, and for close to 20 years in bank dealing rooms in the City, latterly as Executive Director in charge of analyzing global FX markets for a major European bank. He has traveled to some 40 countries on business. He is presently researching imperialism and the world economy. Visit his blog, Economics of Imperialism, and facebook group, which are intended to generate informed debate & discussion.